Molly is a GQA Digital Pre-Press Apprentice at Royal Stafford in Burslem, Stoke-on-Trent and is completing her Apprenticeship with Axia Solutions of Stoke. Her Assessor is Henryk Szor. This is the third year in a row that one of Henryk’s GQA Apprentices has won a coveted Staffordshire Apprentice of the Year Award. 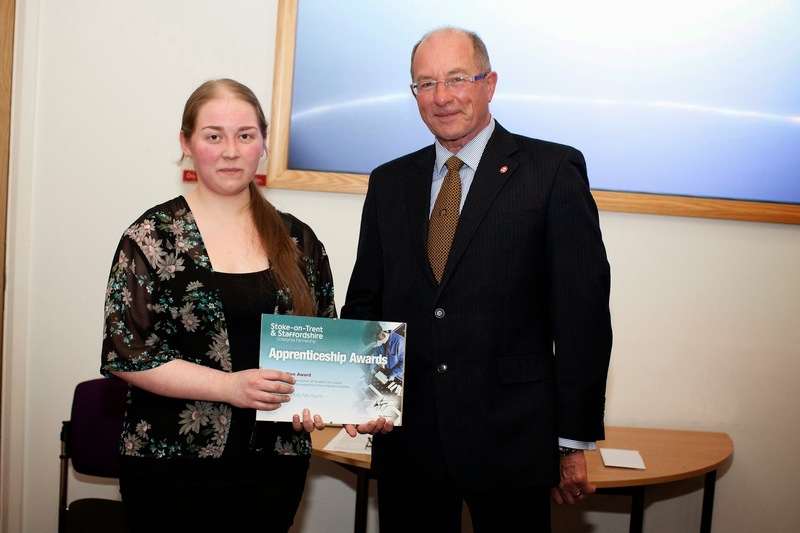 Last year Josh Sheldon of Tungate Label, was presented with the 2014 Apprentice of the Year Award and in 2013 Amy Ann Birchall of Personalised Gifts won the award. Molly joined Royal Stafford straight from college. At the time, the company was looking for a number of apprentices to join the workforce, including a lithographer, which Molly applied for. However, upon seeing her CV, Factory Manager John Nixon noticed a number of awards and achievements Molly had received in art and design, including her skills in ICT. In light of this, Molly was then taken on as an apprentice design technician, working with the in-house designer at the company, Carly Dodsley. When Carly went on maternity leave, Molly stepped up to the plate! From her original Apprenticeship of artwork preparation for print, Molly has enthusiastically covered the workload and has been extremely successful both for the company and in her own Apprenticeship development and achievements. Molly’s role has broadened to include creating designs based on briefs from within the company and also from high street retailers. This role also involves a significant understanding of the production process from shape design through to printing. Molly works with the team of printers on the factory to ensure that designs are suitable for the printing process and successfully communicates on the colours required. She is also required to communicate effectively with external companies who manufacture the polymers for the printing process. She is the key bridge between manufacture and design. Henryk says “It has been a privilege being involved with Molly’s development at Royal Stafford. She has just completed her Level 2 Apprenticeship in Digital Pre Press is about to progress on the Level 3 route”.